nopCommerce - ASP.NET open source shopping cart. Roadmap. We are committed to providing the best eCommerce solution possible, and this roadmap is intended to keep our users up-to-date on where nopCommerce is and where it's going. We know how important these features are to merchants, but we advise you to not make any serious business decisions based on an unreleased feature. 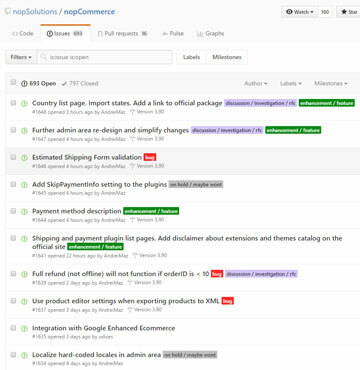 We're always adding to the list of features for nopCommerce, so check out our current Feature List, or visit this page to find out the complete list of the upcoming or proposed features in our eCommerce software. A regular release schedule is every 6-7 months with the features primarily driven by ideas of our users.